I do not forget Thy statutes. 84 How many are the days of Thy servant? When wilt Thou execute judgment on those who persecute me? Men who are not in accord with Thy law. But as for me, I did not forsake Thy precepts. So that I may keep the testimony of Thy mouth. Over 22 days (with a little Sabbath rest in the middle) it is my hope to soak in and meditate on Psalm 119. This is the longest chapter of the Bible with 22 sections. Each of the 22 sections is an acrostic in the original Hebrew language that alliterates each statement with one letter from the Hebrew Alphabet. In reading through this Psalm, one can find the meditations of the heart, the movements of the hands, & the all surpassing Grace of God. 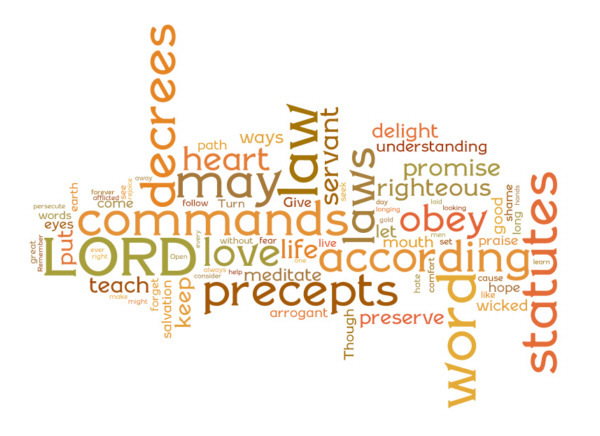 Kaph is the 11th segment of Psalm 119. We are halfway through this incredible Psalm, and ironically, halfway seems to be a such a breaking point for many. It is that continental divide that separates the ascent upward from the descent downward. It is at this point the psalmist uses the word “languish”. When I go hiking, I languish with thirst. Only the water can satisfy and quench my thirst. The psalmist languishes for the thirst quencher of God’s salvation. What a great craving and desire. Jesus Christ when He walked this earth (Yes, the Living God walking this earth in the flesh, John 1:14) said that there was a blessing for those who hunger and thirst for righteousness for they would be filled or satisfied. (Matthew 5:6) Such an amazing promise that we have been given and the psalmist declares his longing from his soul for this salvation to be made manifest to him. Because of this languishing thirst and longing, the psalmist knows the source to find hope is the Word. It is the revelation of God Himself. It is the revelation of God’s will. It is the revelation of Truth. It is the revelation of the Gospel, the Grace, and the Glory of Jesus Christ. This is the psalmist’s source of hope and knowledge of God, and it is not just seen as a textbook of facts (although it is authoritative in its facts), but it is a gift of God to be our provision from Him. The psalmist declares his struggles through life and those with his fellow mankind. They make this languishing even deeper. But end v. 88, the psalmist declares that Revival comes from the languishing for the Word and the satisfaction of God Himself in all His abundant lovingkindness.